The Conestoga was the first horse breed made in the USA, and with it came cultural influences that are still with us today! The Conestoga Horse is the first actual horse breed to be developed in America. It began to be seen in Pennsylvania between 1700 and 1730. It was developed by the Pennsylvania Dutch to pull the big Conestoga wagons. 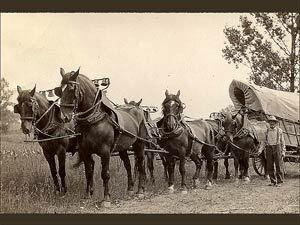 These wagons were first made near Lancaster in the town of Conestoga. The Conestoga breed was a medium to heavy draft horse, developed both for pulling and riding. It had a strong body with long striding legs giving it a steady active motion. It was probably about 16 to 17 hand high and weighed around 1,550 pounds (700 kg). The breed was descended from Flemish stallions crossed with Virginian mares, but its absolute heritage is uncertain. The Pennsylvania Dutch farmers who bred this horse were German-speaking immigrants, and the concept of a draft horse would have been familiar to them. The Dutch in the New York area had been importing heavy horses from Holland for some time, and William Penn is also said to have shipped in a load of Great War Horses, thought to be Tamerlane Horses, in the 1680’s. Either of these could have influenced the breed. Freight was hauled by wagon across the Commonwealth roads for more than 150 years. But gradually shipping west of Philadelphia was made easier and faster by boat and canal transport, and then by train. In the early 20th century the Conestoga Horse disappeared. Although the Conestoga horse breed is gone, other cultural influences were brought about by the freight hauling heritage. Some of these are still with us today. While researching the history of horse breeds, I came across these interesting factoids in Judith Dutson’s book “Storey’s Illustrated Guide to 96 Horse Breeds of North America,” and can’t resist sharing them. 4 more historical “firsts” ushered in with the Conestoga Horse! The Conestoga wagon was pretty, painted in a bright Prussian blue with white linen tops and large scarlet wheels. They were huge rigs, capable of hauling up to 6 tons of freight, and they would often travel in trains of up to 30 vehicles. When these huge wagons would travel down the road, there was little room for oncoming traffic, and these wagons did not yield. These large wagons had no seat for the driver, but rather they often had a special board sticking out on the left side for the driver to stand on. Oncoming traffic would have to veer out to the right to make room for the wagon and its driver. So this is where the American tradition of driving on the right side of the road originated! During this time, the horses were fitted with harness bells. For the header horses there were small soprano bells and the middle or swing pairs had tenor bells. A bass toned bell was fitted on the right wheelers, but the left wheelers had no bells. If a wagon became stuck, help was available but usually with the payment of one or more bell. The bells became important trophies of skill and success for the teamsters. Thus the expression “to be there with bells on” was born! The teamsters of these huge wagons liked to smoke, and cigars were what they smoked. Thus the word “stogie” is derived from these cigar-smoking drivers! The Conestoga wagons were a larger version of what became known as the “prairie schooner” used to transport settlers in the 1800’s. The design of the wagon was reduced between 1820 and 1830, modified for family travel rather than heavy commercial hauling. These wagons were traditionally painted in subdued browns and greens, and thus was born the prairie schooners that made their way west. Horses are fascinating and so is their development. Pictures and information for all kinds of different breeds can be found in World of Horses and Ponies! Conestoga Horses photo provided courtesy of ExplorePAhistory. Caption: Farmer John Shreiner and his Conestoga Wagon, Lancaster County, PA, circa 1910. Credit: Courtesy of the Landis Valley Farm Museum.